Try something different in this Eid. Enjoy. Everytime we cook someting for special occasion, meat gets too much priority that we donet get balanced diet. Nowadays lot of people are turning vegetarians. So for sake of balanced diet and give option to vegetarians vegetable kofta is the vegetarian alternative to meat kofta. just make sure that add kofta in hot gravy 10 minutes before serving, longer than that will ruin the crunch of vegetable kofta. 1. Wash vegetables well, pat dry completely and grate in a grater or food processor. 2. Squeeze grate vegetables, remove the excess water and keep the juice (we will use juice for gravy). 3. 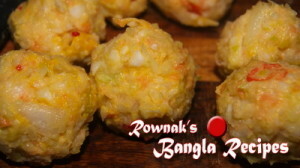 Mix the rest of ingredients with the grated vegetables and roll into small balls. 4. Heat pan with oil for deep fry and fry kofta a small batch till it becomes golden brown. 5. Heat oil in a pan and add bay leaves, ginger, chilli powder, turmeric and green chillies and cook till oil is separated. 6. Add 2 tablespoons water and cook again till oil is separated. 7. Add the juice and bring it to boil. 8. Add salt, sugar and cook till you get your desire gravy consistency. 9. Remove from heat and add add the fried kofta in hot gravy 10 minutes before serving. 10. 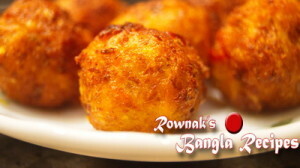 Enjoy Vegetable Kofta / Sobji Kofta with rice or polau. Your dishes are mouth watering. Thank you.